Four African penguins at the Vancouver Aquarium were in the spotlight yesterday, as the Aquarium celebrated World Penguin Day. 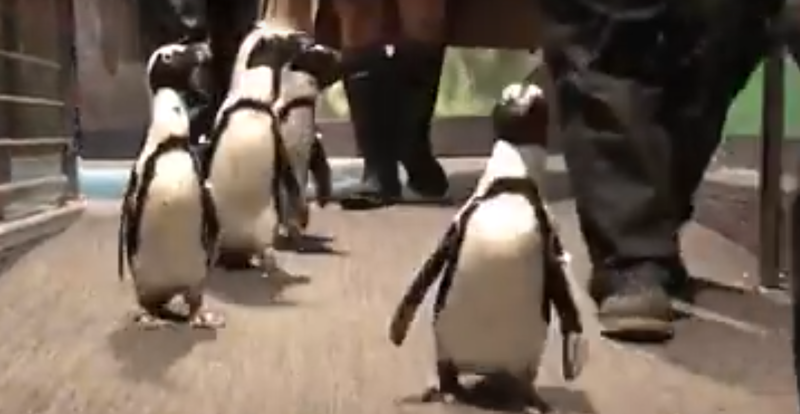 As part of the celebrations, the Aquarium held a “March of the Penguins” event. It was captured on video, and it might just be the cutest thing we’ve ever seen. The daily “Meet a Penguin” program is part of the enrichment for the penguins, an important part of animal care at Vancouver Aquarium. The Aquarium said these “enrichment sessions” take different forms based on the animal – for the African penguins, it’s a change of scenery or exposing them to new places, sights, sounds, and smells. In the wild, these animals live in rocky islets and on the coastal beaches of South Africa and Namibia. “Meet a Penguin not only acts as an enriching experience for the animals but it gives our visitors a chance to get up close to these incredibly charming birds and learn more about their species, the challenges they face in the wild, and how we can all help,” the Aquarium said.